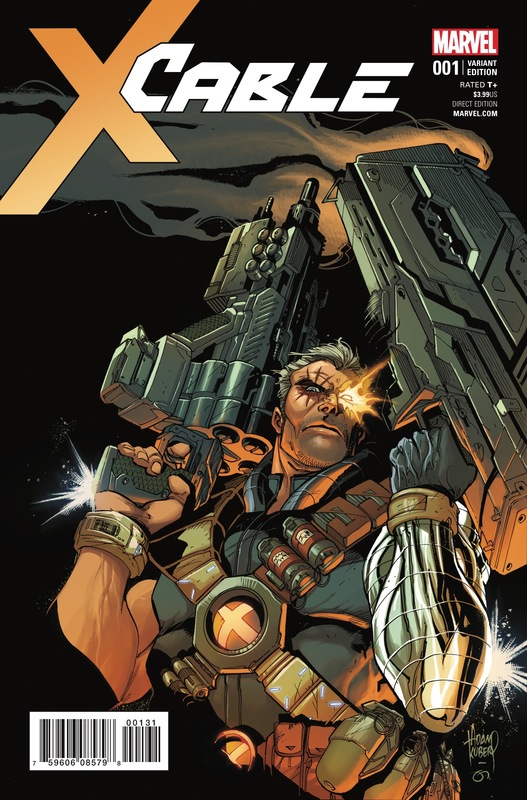 Cable #1 Review – AiPT! Judging by the preview, Cable is going to be doing some major time travelling and not just to the usual locations; namely we mean not anywhere where X-Men are hanging out. Join series writer James Robinson and artist Carlos Pacheco as they take Cable to…the Old West!? So what’s it about? Seriously, did you read the preview? Cable hasn’t done a ton of time hopping to times prior to those of the mutant shenanigans we’ve seen already, which is sort of suspect right? You figure the guy might want to take a look at the dinosaurs or see ancient Japan, right? Apparently not, as Cable #1 sees him forced to hop back in time to stop a villain. Man, he really is all business. If this issue aims to prove Cable could have one hell of a TV show then color me convinced. Robinson and Pacheco open in 1874 and quickly showcase Cable in a fish out of water story like no other. Then he gets shot at with laser weapons! Seriously, this issue offers plenty of surprises and turns the whole time travelling thing on its head. It also does so without tons of sci-fi elements, but average locations that would normally be, well, normal. Cable sticks out like a sore thumb, but throwing him into these locations adds a mystery element that you’ll want to get to the bottom to. Just a normal town. Nothing to see here! Cable himself is clearly after someone–or something–and that adds an element of surprise each time Cable time hops. At one point Robinson introduces a group of Ronin, which is a reminder Cable is similar to them in many ways. A hero who ventures on his own with no master righting wrongs…he’s a much cooler hero than most give him credit for. Robinson does a good job establishing that. Pacheco draws a good issue with each locale looking spot on and believable. Some interesting digital effects are used later in the issue to make the enemies Cable is up against look more formidable, which adds to the danger quotient. The final full page spread is quite something and it’ll leave you at the edge of your seat. To describe it is to spoil it, but let’s just say the point of view is deliberately unnerving. It is however, a quick read. As opening issues go there isn’t a lot of answers, a heck of a lot of mystery that drives you forward, but nothing to really sink your teeth into. Overall it feels like a good opening stinger to a TV show or movie, but not necessarily a full episode or act. Given the serial storytelling of today that’s not too surprising, but it’s unfortunate as it leaves you wanting more and not completely in a good way. Cable is off to a great start and it makes a strong case that the character deserves a movie or at least a TV show. Issue #1 keeps you on the edge of your seat every step of the way. A great opening issue that'll have you on the edge of your seat.